To dream of a day when Hair is no longer relevant may be a futile and hopeless prospect. Close to fifty years ago Gerome Ragni and James Rado wrote this smash Broadway hit, inspired by the actual draft dodging kids of that era. They wanted to bring what they saw in the streets onto the stage. Now, in 2014, ArtsWest has revived it and takes the audience on a trip; a trip that travels neatly between nostalgia and protest. Many of us would hope that some day this protest play would lose its relevance as pointless wars, racial tensions, and world destruction would fall away into memory, like bellbottoms and benzedrine. Sitting in with ArtsWest last night however proves Hair has not lost its relevance, nor has it lost its power. By power I mean flower power, and by flower I mean weed, for though the 1960s were filled with protest and social change, Hair is a blatant reminder that the protesters were stoned. But what is it about a group, or tribe, of stoned teenagers rejecting social norms that moves us so? Well, in this production, directed elegantly by David Gassner, it is the sense of community, freedom, and love that pulls together what could well be a drug fueled romp down memory lane. This particular group of actors come together to form an explosive synergy, each as lovely, dextrous, energetic, and earnest as the next. The harmony of the cast, or tribe, is testament to the choreography (Mary Angelo). Running, leaping, dodging, dancing, spinning and tumbling the tribe mingles in a controlled chaos that could go very wrong in this small space, but instead works as the actors weave amid each other avoiding collisions, while sustaining the high energy needed for this marathon melodrama. Mathew Wright (Music Direction) does a lovely job recreating the music of Galt MacDermot, and the visible band in the impressionistic Grand Central Station (Burton Yuen) has the effect of street musicians patrolling the depot for some coin, and horn player (Greg Derk) impresses with his varied instruments. 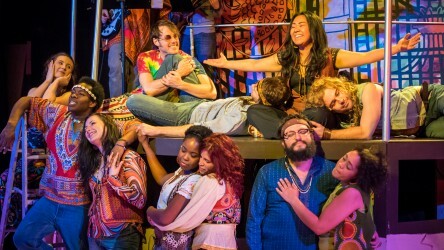 This musical set in the “psychedelic stone-age” is a fine reminder that social injustice, racial tension, and war are still palpable issues today. Maybe some day we won’t need these trippy teens to remind us to “stay off the grass”, to stand up for what we believe in, and to love, love, love.